The U.S.S. Memphis returns from its last trip. After being deployed for two months, the U.S.S. Memphis returned home to the Naval SUBASE New London on Wednesday morning for the last time. The Memphis returned from its last mission just before 10 a.m., when the submarine pulled into the Groton Pier. The 135 crewmembers were all anxious to see their loved ones. “I was so excited I didn't even sleep last night, and when the boat came in, I was like, ‘Pull in quicker, pull in quicker,’" said Chelsea Sivo, from Cranston, Rhode Island, who was waiting for her boyfriend, Chief Petty Officer, Brian Paugh. Elvis Has Left the Submarine! After more than 30 years of service, the U.S.S Memphis pulled into the Naval SUBASE New London for the last time Wednesday. Paugh surprised her by dressing as Elvis. 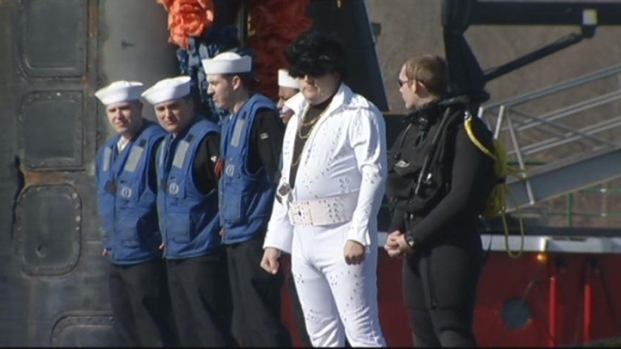 Because the sub is named the Memphis, it's customary for a sailor to be dressed as the rock-and-roll legend at each homecoming. Paugh said he had no hesitations when asked to play "The King." "Since I love Elvis and Johnny Cash, I decided sure why not I'll be Elvis," he said. The families decided amongst themselves who would get to greet their sailor first. Paugh, from Kenton, Ohio and his girlfriend were chosen as one of the couples to have the "First Kiss." The other couple to lock lips first was Electronics Technician 3rd Class Christopher Shepardpearson and his wife, Gina. The Shepardpearsons are from San Antonio, Texas. The family chosen for "First Hug" was the Ratliffs from Minneapolis. Petty Officer Jeff Ratliff said the excitement was building onboard the sub for the past day. "I couldn't really asleep. All the guys were up all day, just talking about their families," he said. His wife, Moriah, and their two children, Trinity, 1 and Jeffrey Jr., 4, greeted him. "I run and gave him a hug and he picked me up. My daddy is here and his boat is not underwater anymore," little Jeffrey said. For Moriah, and many other Navy families, it has been hard for the sailors to be away. "It's very tough. I think people underestimate what the wives actually go through being home with the children, the stress of not hearing from your husband, not knowing when they're coming home, what they're doing, what's going on. It’s tough, but it’s worth it when we have these reunions like this," she said. The Memphis was deployed to Europe for two months and the homecoming was bittersweet. This is the last deployment for the sub, which has been around since 1977. "Since commissioned in 1977, the USS Memphis has pretty much gone all over the world. She's deployed to every ocean up north, to down south and every tasks attack subs do all around the world in her 33 years," Captain Carl Lahti said. To begin the process of decommission, the submarine's key components, such as its nuclear reactor, will be taken out. An official decommissioning ceremony will take place April 1 at the sub base and then the Memphis will be sent to the naval shipyard in Portsmouth, New Hampshire.